Valérie Gonzalez specializes in Islamic art history and aesthetics. She holds a Ph.D. in Islamic Studies and a Master of Fine Arts. Her research addresses questions such as figurality, ornament or abstraction in Islam visuality. Her scholarships include the Kunsthistorisches Institut-Max-Planck-Institut, Florence; The Getty Research Institute, the Aga Khan Program for Islamic Architecture, MIT; the Institute for Advanced Study, Princeton. She is the author of Aesthetic Hybridity in Mughal Painting, 1526-1658, Ashgate 2015; Le piège de Salomon, La pensée de l'art dans le Coran, Albin Michel, 2002, and Beauty and Islam, Aesthetics of Islamic Art and Architecture IBTauris, 2001. With the development of a global museum culture since the eighties, called ‘curationism’ by David Balzer, the question of how to show ancient art both in newly founded institutions and in refurbished historic displays, is more than ever relevant. As much as contemporary art, artistic heritage participates in the new cultural discourse defining nations and communities, channelled through world-class museums and galleries. In that context, the Islamic artistic traditions gained tremendous visibility, as venues like the Museum of the Islamic Art in Doha or the Louvre’s new scenography in Paris, put these traditions on the forefront of the international stage. 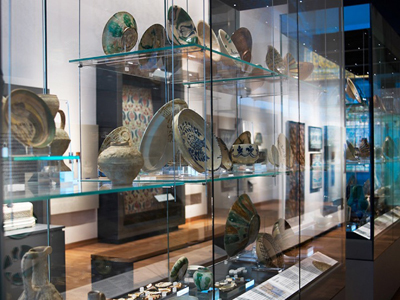 This article examines this museology in transcultural perspective, through a comparison between Islamic and Korean ceramics installations in the renovated Ashmolean Museum in Oxford, and in the Leeum, in Seoul. The former privileges an archaeological narrative, the latter an aesthetic phenomenological approach. In revealing a qualitative asymmetry between the exhibitory practices in the areas of Islamic and East Asian art, this comparison allows for further discussion about museological issues such as the tension between didacticism and aesthetics, or the competitive relationship between architecture, design, and art in the displays’ space. Ultimately, the comparison posits East Asian experimentalism as a model from which to draw inspiration for reinventing the curation of Islamic art. The present essay offers a viewpoint on the topic proposed that will not achieve unanimity among the scholarship, nor does it aim to do so. The intention instead is to open a debate and propose new ideas about the presentation of objects of artistic heritage, such as ceramics, in twenty-first century museums and galleries. Indeed, owing to the global phenomenon called ‘curationism’ by David Balzer, today world-class sites of art display showcasing rich historical holdings significantly contribute to re-shaping perceptions and relationships between peoples, communities, and nations.1 One of the latest instances of this phenomenon is the Louvre Abu Dhabi, built by Jean Nouvel. The East-West axis of cultural interface, the magnitude of which is manifested by this Emirati museum, has had a major impact in the past decade: the unprecedented global exposure and visibility of the Islamic arts. Suffice it to mention, there is also the Aga Khan Museum in Toronto, the Museum of Islamic Art in Doha, the big-budget re-installations of the famous collections of this material in the Metropolitan Museum of Art (Met) in New York, and in the Louvre in Paris. The present essay discusses this area of museology in the light of global contemporary museum practices.2 It does so, however, by basing the discussion on a museum event experienced by its author. Below is an account of this event. Museum Studies deal with experiences in what Gernot Böhme calls ‘perceptual contexts’.3 My own experience took place in two such contexts that I visited within a short period of time: the renovated Ashmolean Museum of Art and Archaeology in Oxford, and the Leeum Samsung Museum in Seoul.4 In the former, I went to visit the gallery of Islamic Art with the expectation of a modernised presentation after a big-budget campaign of refurbishment, while in the latter, I came across displays of ancient Korean art during a leisurely visit of cultural landmarks in Seoul. Less known in the West than the Ashmolean, the Leeum necessitates a brief introduction.5 Inaugurated in 2004, it consists of three edifices built by Mario Botta, Rem Koolhaas and Jean Nouvel: Museum 1 presents a collection of traditional Korean art; Museum 2 features national and international contemporary art; and the third is a Child Education and Culture Center (Figures 1, 2, 3). Interior view of Museum 1 built by Mario Botta, Leeum, Seoul. Photograph: courtesy of Pascale Vialleton-Touzan. 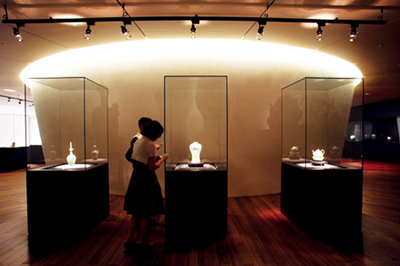 Gallery of Korean celadons, Museum 1, Leeum. Photographs in the public domain. Visiting these two institutions consecutively has revealed an unsettling contrast between the exhibitory modalities they employed to display their historical holdings, beyond the obvious fact that the Ashmolean and the Leeum have a different history necessarily reflecting different constraints and philosophies of display. One is an old British establishment premised upon the hegemonic Victorian vision of the world, the other a Korean vanguard creation of this century on Korean soil (Figures 4, 5, 6). However, the act of renovating ought to have had occasioned not an erasure of course, but a reduction of these differences. What would otherwise be the point of renovating? Instead, the contrast was so sharp that it compelled me to examine its causes and, in the process, produce a more general comparative critique of the curation of Islamic and East Asian artistic heritage. The present essay is the product of this double endeavour, although three epistemic points need to be clarified. 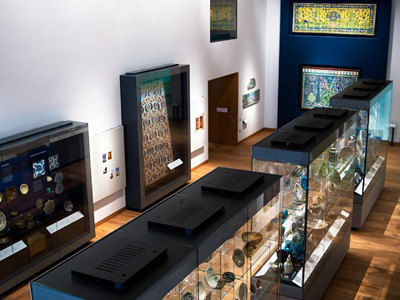 Islamic art gallery, Ashmolean Museum of Art and Archaeology. Photographs in the public domain. First, this comparison’s perspective is not museological history, but new museology that concerns both the Ashmolean’s gallery of Islamic Art as an example of contemporary reinstallation of a historical display, and the Leeum’s presentation of Korean artistic tradition as an output of this new museology.6 Second, this study does not address the important corollary question of the curation of East Asian art in Western museums. The matter, however, deserves a study. Third, apart from general comments, my critique of the Ashmolean’s reinstallations is limited to the Islamic Art displays. Thus, this pinpointed pattern of difference between the Ashmolean and the Leeum has appeared to me symptomatic of a broader condition that I would characterise as a qualitative asymmetry, by contemporary standards, between two curatorial practices. Important in both institutions, the ceramic wares’ installations struck me as particularly revelatory in this regard (Figures 2, 3, 4, 5, 6). While the Ashmolean repeats a traditional exhibitory scheme, the Leeum’s Korean ceramic galleries in Museum 1, most notably the gallery of Goryeo celadons on the top floor, creatively addresses a challenge that concerns the curatorship of both Islamic and East Asian artistic heritage: how to showcase finely-crafted items of practical use, albeit of great cognitive reach, that challenge the established narrative about high art versus archaeological evidence/material culture?7 How can these items not be reduced to decorative objects d’art or to mere historical artefacts with relative artistic value in the museum’s space? The Leeum’s approach to this challenge and the fact that the Korean and Islamic clay arts share significant commonalities, drove me to focus the comparison on these specific installations. Ceramics constitute a cultural signifier highly emblematic of both Korea and Islam’s civilizational history.8 Although obviously distinct in terms of aesthetics, meaning and form, the ceramic production in these regions share, as we know, the historical linkage with Chinese clay art.9 Crucially, Islamic and Korean ceramics are of the same aesthetic species. As in East Asia, in Islam the making of ceramic wares traditionally transcends the pragmatics of trade and commodity consumption to reach the highest aesthetic level of artistic expression.10 And in both cultural areas, ceramics convey as much value today as in the past. A brief description of these objects’ complex aesthetic ontology will make the point. Bowl, Nishapur, Eastern Iran, 10th century. Earthenware, black slip on a white slip ground. H. 7 in. (17.8 cm) Diam. 18 in. (45.7 cm). Museum number: 65.106.2. Roger Fund 1965. © 2000–2016 The Metropolitan Museum of Art. 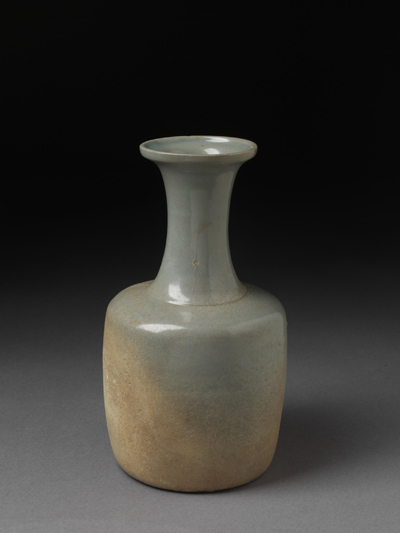 Bottle, Korea, 1100–1150. Stoneware, thrown, with incised decoration under celadon glaze. Museum number: C.529-1918. © Victoria and Albert Museum, London 2016. This ontology and the aesthetics it materialises ought to be made phenomenologically apparent and apprehensible in any installation, independently of the museum’s intended narrative, archaeological, artistic, ethnographic or else.13 In this respect, the Leeum succeeds and the Ashmolean fails. The Ashmolean’s failure lies in an excessive didacticism, combined with a flawed visual semiotic and a deficient aesthetic presentation. Placed inside high glass cases, the ceramics fill up the shelves from bottom to top, and on all sides (Figures 4, 5, 6). The densely-furnished surrounding walls only increase the saturated aspect of the display. Clearly, the agenda was to show as much material as possible within the space allocated, so as to deliver a historical-archaeological narrative as comprehensive as possible. To better ensure the visitors’ grasp of this narrative, numerous explanatory cartouches are placed close to the items. This scheme, all too frequently used in institutions housing historic heritage, generates an overlap between textual and optical cognition that tends to impair the reception of the object’s aesthetic phenomenology and this object’s appreciation by the spectator. A similar example is the David Collection in Copenhagen, which possesses a fine Islamic art collection.14 Here, the invasive written documentation transforms the displays into an open art history book in which the objects seem to play the role of illustrations. To cite a counter-example, aware of this problem, the curators of the picture gallery in the Kunsthistorisches Museum in Vienna have removed all documentation from the walls; instead, metallic structures engraved with the painting’s descriptions have been installed at a sensible distance of the works. To return to the Ashmolean, the ceramics selection itself betrays minimal consideration for the art they represent. The spectrum of objects indifferently ranges from shards, to products of average artistry, to fine works. In the absence of aesthetic logic and stimuli, the installation leaves up to the viewer the discernment of artworks in the miscellany of items. This disregard for the art raises this question: are archaeology and art-aesthetics mutually exclusive concepts in display? A positive answer to these questions would betray an antiquarian conception of archaeological installations, and of archaeology tout court. In contemporary museology, archaeological scenographies, like any other type of display, require visual clarity and compelling space and object organisation for an optimal efficiency of knowledge communication. 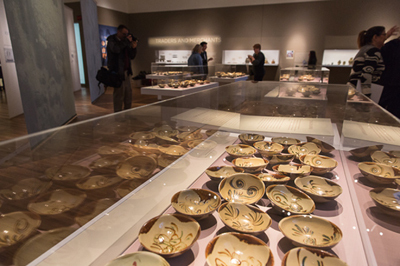 This was achieved, for example, in the traveling exhibition held in the Aga Khan Museum in Toronto, in 2014, ‘The Lost Dhow: A Discovery from the Maritime Silk Route’.15 In this exhibition, the presentation of archaeological hoards of Chinese and Islamic ceramic wares was powerful in highlighting both the pragmatics of their function as utilitarian objects, and their aesthetics as artworks meant to induce a sensory experience16 (Figure 9). View of the exhibition ‘The Lost Dhow’, Aga Khan Museum, Toronto. Photograph in the public domain. Indeed, today museums are conceived as sites of total experience, namely an experience that is altogether aesthetic, psychic and noetic. Therefore, contemporary museum design emphasises object and space phenomenology by means of which a multilevel relationship between the viewed and the viewer can construct itself, thus making of the gallery ‘a relational’ space.19 In contradistinction with the Ashmolean, the Leeum Museum 1 forges its galleries into highly-relational spaces for a total experience of Korean art. 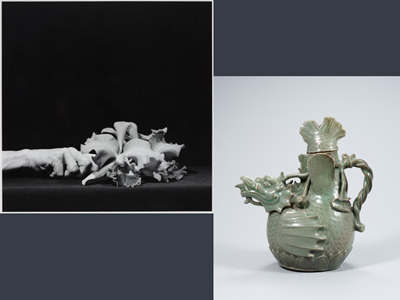 Museum 1 masterfully stages the sublime in the Korean art of ceramic, by optimising the conditions of operation of both the objects’ aesthetic phenomenology and the type of spectatorship it engages, centred on contemplation. To do so, it develops three main design strategies. The first strategy is the theme gallery, much more frequently used in East Asian art displays than in their Islamic counterparts. The Capital Museum in Beijing, for example, thematically presents its collections of ancient Chinese art inside a tower, like the Leeum (Figure 10). Perhaps more than other exhibitory options, the thematic gallery warrants art appreciation and empathy. Empathy, says the curator Woo Hyesoo, is a priority in the Leeum’s curating philosophy.20 Islamic art installations, by contrast, privilege scenographies that emphasise patterns of historical didacticism and aesthetic syntheticism that manifest themselves through the wide range of things viewers are given to see within one and the same exhibitory space. I call this formula ‘the sampling model’. 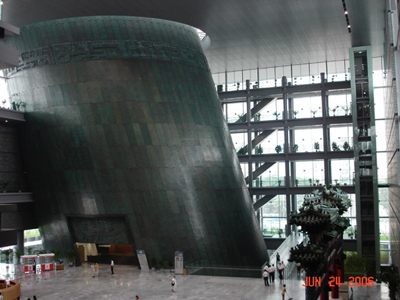 Interior view of the Capital Museum, Beijing. Photograph Valerie Gonzalez. The second strategy concerns the installations’ discursive framing. The galleries signal their aesthetic-phenomenological conceptualisation through straightforwardly ahistorical declarations of content evoking the objects’ plasticity: ‘Pattern: Magnificence and Precision’; ‘Form: Elegance and Craftsmanship’; or ‘Brushwork: Creativity and Command’.21 In addition, written documentation is reduced to the essential in order to neutralise the tension between showing and talking about the artworks in the display. Explanations are confined to the galleries’ entrance, while audio guides provide history and context information if desired. But within the installations’ perimeter itself, except from very discrete small captions carefully separated from the items, art and visuality reign supremely. And the cognitive mode is aesthetic perception in the absolute. The third strategy concerns the choice of objects of superlative aesthetic quality. If the museology involving Islamic art still questions the concept of the masterpiece on the basis of its subjectivity, for contemporary curators of East Asian material, this issue does not seem to have relevance.22 The recently-created art installations throughout the region demonstrate the extreme care placed on the selection of the material exhibited. It is not that history is taken for granted— in Museum 1, historical information remains available by means of audio devices. It is just that the East Asian curating philosophy seems to put aside the sempiternal problematics of learning versus appreciation, to embrace instead the logic of appreciation as learning. In Museum 1, the joining forces of these strategies serve what I would describe as revelatory visions of perfection akin to Joycean aesthetic epiphanies.23 In this regard, the celadon gallery surpasses them all. Its scenography exudes ‘wholeness, harmony and radiance’ in the true Thomistic-Joycean sense of these words, enabling the viewer to feel ‘a peculiar revelation of the inner reality of an experience, accompanied with great elation, as in a mystical religious experience’.24 The celadons placed in an isotropic curvilinear unfolding and the roundness of the gallery’s space intensify this enrapturing impression. The building’s four galleries form a system of circular corridors in ascending movement, like in the pioneer Guggenheim Museum in New York. (Figure 1) Phenomenologically in architecture, roundness induces a gentle bodily progression throughout space, akin to the mind-elevating movement of circumambulation. However, unlike in the Guggenheim, where light and space fluidly circulate in and out, in Museum 1 and in the Capital Museum’s tower, a dramatic shift of atmosphere disconnects the outside from the inside of the exhibitory perimeter, forming a peaceful area of art contemplation (Figure 10). In this space, a highly-controlled lighting lets the precious items shine in the dark, irradiating with intense significance. The sublime in Korean art reveals itself through itself, putting the beholders on an aesthetic journey increasingly noetic as the sightings of the awesome artefacts follow one after the other. Such a description conjures up images of illuminated objects of cult in the sacred ambience of dimly-lit places of worship. By the same token, it raises the semiotic question of the museum as a kind of temple. In religious institutions, sacredness resides not only in the venerated holy objects, but also in the special textures of the architectural space and light. In non-religious perceptual contexts, the super-potent alliance of space as light-shaping device with light as space-shaping device may create an infinite array of sacralities with or without spiritual meaning. I call ‘the temple effect’, this phenomenology of the sacred artificially created by space and light-shaping in these contexts in general, and in the context of art museums in particular. In a pivotal study of the meaning of art museums as public institutions ‘offering up values and beliefs’, Carol Duncan designates them in terms of ‘ritual structures… structured around specific ritual scenarios’.25 The temple effect plays a determinant role in the setting of these scenarios. The Miho Museum, for example, purposely constructs this association museum-sanctuary in both its installations and architecture, I.M. Pei’s oeuvre.26 However, the use of this effect can be tricky. Although a great visual enhancer and stimulus in the museum’s space, it may construct gratuitous or incongruous sacralities. In the Museum of Islamic Art in Doha, the over-exploitation of the temple effect creates a theatrical atmosphere that appears inadequate in respect of the phenomenology of most of the artworks displayed (Figure 11). In accordance with the precincts’ architectural logic of spectacle, inside the galleries the light flowing from high above the installations seems to descend from the heavens. While filling the luxuriously-fitted, spacious rooms with cold loftiness, this sacral luminosity sanctifies the artefacts within its field. This sanctifying process is reinforced by the haughty voids that surround and fill the encasing devices, disproportionately big in relation to the size of the items. Problematically, however, objects such as books, ivories and metalwork are typically used in private, intimate environments. While awe-inspiring because of their high artistry and meaning, these objects’ aesthetic properties and operations require, in order to be appreciated and effective, a relationship of proximity between the beheld and the beholder. 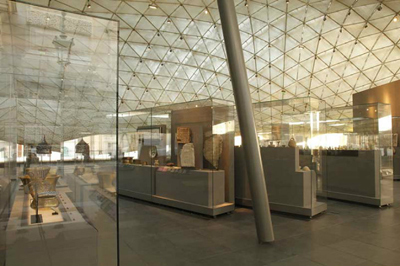 Interior view of the Museum of Islamic Art, Doha. Photograph in the public domain. Contrary to these requirements of intimacy and accessibility, the museum’s lofty theatricality conspires to place the visitors at a ritualistic distance from the artworks, prompting them to enact a performance that has common phenomenological features with the veneration of untouchable sacred relics or unaffordable high-end commodities ‘religiously’ protected by glass or space walls.27 As a result, the displays project an image of the artefacts as sacred fossilised treasures that perhaps appears glamorous, but that falls short of truthfulness to the art’s ontology. In a similar case of inadequacy between display design and objects displayed, the new gallery of Islamic art in the Louvre makes use of, to not say abuses, elaborate theatrics and light effects. The extravaganza in lieu of Islamic art display in the Louvre immerses the visitor in a swirling dramatic show whose central stage is not the exhibited collection, but the gallery’s ceiling, a huge undulating device with golden hues that evokes superstructures such as sport facilities, malls, and airport terminals (Figure 12). Topping the two level-gallery in the Cour Visconti, this construction forms a counterpoint to I.M. Pei’s famous pyramid in the Cour Napoleon.28 Although the latter limits its architectural-aesthetic function to covering the museum’s lobby, the former exceeds this function, as it partakes of the displays. In this respect, the dramatic roofing steals and spoils the show. View of the upper level of the gallery of ‘Islamic arts’, Cour Visconti, Louvre, Paris. Photograph in the public domain. In fact, temple-like grand settings such as these two examples of the Qatari museum and the Louvre reflect a broader phenomenon in contemporary museum architecture related to the multiplication of creations supported by colossal budgets. Targeting Frank Gehry’s oeuvre, Hal Foster calls this phenomenon ‘the lavish gestural aesthetic of the present’, and unflatteringly describes some of these new hyper-costly art buildings as ‘sites of spectacular spectatorship, of touristic awe. Showy, self-advertising, shallow’.31 If, in the past, art museum’s architecture similarly projected power and grandeur, it nevertheless did so within the limits of a primary function of framing the collections. Most often the emphasis was placed on the spectacular façade, while the interior design maintained the balance between architectural design and art show. Even in the most lavishly-decorated institutions like the Kunsthistorisches Museum or the British Museum, that balance was never compromised. However, the enormous power bestowed on the architects today has changed the rules of the game. Although museum architecture has become more than ever a platform of creativity, this power not only has produced this side effect described by Hal Foster, but also it has challenged the traditional status of the art collection itself vis-à-vis that of its host institution. The balance has turned into a competition. A palpable consequence of this phenomenon is that the architectural enterprise too often appears to outbid the showcasing of the art. 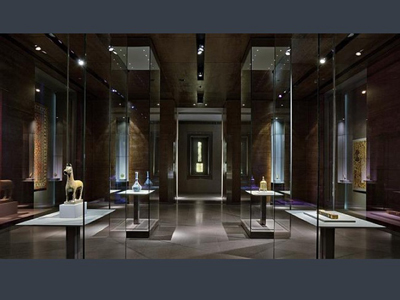 For example, in Doha’s Museum of Islamic Art, the interior’s grandiosity projects too visibly both I.M. Pei’s stratospheric artistic reputation and Qatar’s ambition of world representation. The stupefying construction, akin to a modern Orientalising fairy tale palace, de facto posits the artworks as only the small part of a bigger scenario in which they are no longer the topic but the pretext.32 In the overbearing environment, the delicate ancient artefacts appear more like the building’s decorative furniture than autonomous aesthetic entities. Obviously, this is only a trend, counterbalanced by counter-trends. The Aga Khan Museum’s ultra-contemporary architecture, for example, does not lose sight of its mission of housing exceptional holdings of Islamic art. How does Museum 1, the place that prompted this reflection in the first place, position itself in this configuration of trend and counter-trends? Our description of the aesthetic epiphany-inducing displays in Museum 1 legitimately raises the question of the Leeum’s approach to the temple effect. The question is especially relevant because this museum applies the highly ritualistic scheme of the dark room. Does it thereby situate the precious Korean artworks in the region of the sacred, or fuse sublimity and sacrality in the presentations? In fact, while the dark room renders unavoidable the temple effect’s operations and the sort of ritualization of the viewing experience it causes, the genius of the Leeum’s scenographers lies in the conscious avoidance of any drama and pomposity. Indeed, in Museum 1 there is no ostentatious light or space feature that would not be true to the aesthetic nature of the items displayed, and most importantly, to the relational type of spectatorship they implicate. 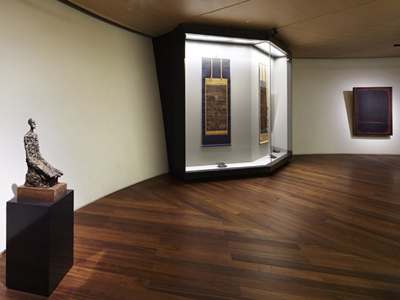 Like for many Islamic portable objects, an empathetic encounter with the Korean artefacts requires the minimisation of this ritualistic distance necessarily imposed by the hyper-protected museum space. Accordingly, the galleries subtly stage the artworks in a cosy atmosphere of intimacy, thanks to an understated albeit ultra-sophisticated design. The lighting, spacing, and architectural design transmute the displays’ environment into a neutral space gently enveloping the illuminated masterpieces that places the absolute focus on the objects and lets them do the aesthetic act alone33 (Figures 2 and 3). For in museum design, only some form of architectural abstraction or discretion allows for such a phenomenology to take place. Unlike the Qatari museum or the Louvre, Botta’s edifice delivers its visual effects, meanings and symbols outside the exhibitory perimeter, thus compartmentalising the show of the architecture and that of the artworks; so does the Capital Museum’s architectural superstructure (Figures 1 and 10). Again, the celadon gallery demonstrates the greatest efficiency in this matter. Here, the space’s abstractive qualities spring from three elements of design: the proportioning of the interior architecture adapted to the human scale, the ultra-minimalism of the material holding and framing the objects, and the drama-free lighting. In its strict uniformity and supersymmetry, the row of glass cases, each one in perfect proportion with the size of the unit it contains, recalls Sol LeWitt’s purist geometric ‘structures’ or Donald Judd’s hyper-lucid series of abstract volumes. Arranged in a gentle curvature, the scenography harmoniously espouses the room’s round shape, thereby furthering the dissolution of the objects’ surroundings into a geometric abstraction. Moreover, the distance between each box has been carefully calculated, not too narrow so as to invite to pause at each celadon, but not too wide so as to avoid the pattern of lofty emptiness seen in Doha; voids would interrupt the display’s fluid deployment metaphorising the serial quality of celadon art. 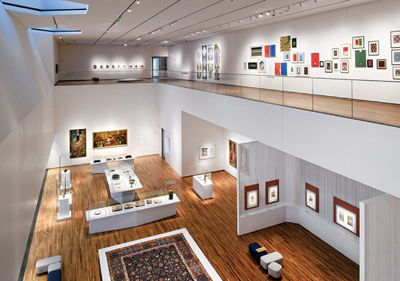 The lighting itself induces something that can be described as the self-effacement of the gallery’s interior design. Contrary to the full-fledged temple effect, the tamed luminosity presents a character of normality, like the useful light of the lamp under which one comfortably reads a book. It just allows seeing, but with the utmost specular acuteness. Under this non-semiotic light, each celadon offers itself to the beholder’s gaze in the pure transparency of its materiality. The variegated shapes, textures, and minute motifs appear in every detail, in high definition like in a Robert Mapplethorpe photograph. (Figure 13) The spectator thus effortlessly acquires the photographer or the ceramist’s sharp eye. And the intended empathy-filled intimate encounter between viewer and art occurs in radical directness. Photograph by Robert Mapplethorpe, ‘Orchid and Hand’, 1983. ARTIST ROOMS National Galleries of Scotland and Tate. Acquired jointly through The d’Offay Donation with assistance from the National Heritage Memorial Fund and the Art Fund 2008. Copyright: ©Robert Mapplethorpe Foundation. Photograph: Antonia Reeve; celadon fish-dragon ewer, 12th century, Goryeo Dynasty, Korea, National Museum of Korea, Seoul. Accession number: Gaeseong-000002-00000. Copyright©National Museum of Korea. Photomontage by Valerie Gonzalez. A rare remarkable Islamic ceramic display recently installed in the Bardo Palace in Tunis presents a similar minimalist scenography34 (Figure 14). Part of a project on the neglected Husseini period in Tunisia (1705–1957), the installation organises the items in a strict isotropic geometric order that, like in Museum 1, thematises the production’s feature of seriality, while highlighting the individual quality of each piece. In addition, the historical precincts of the Bardo contextualise the objects in their original Islamic milieu. Thus, the preserved wall tiling of the historic site meaningfully dialogues with the ceramic wares, as in Islamic artistic culture the clay medium was used to create both portable objects and surface decoration. View of the exhibition of Tunisian ceramics, Bardo Palace, Tunis. Photograph: Issam Barhoumi. Courtesy of Ridha Moumni and Issam Barhoumi. This installation leads us to address the important issue of contextualisation in the fabricated museum environment. Like in Tunis, the Leeum presents its collection in context, but not the original historical one: by including global art of the twentieth and twenty-first centuries in the historical displays, Museum 1 contextualises, or rather re-contextualises, the ancient artefacts in modernity. Gallery of Korean painting, with an Alberto Giacometti sculpture and a Mark Rothko painting, Museum 1, Leeum. Photograph in the public domain. In the paradigmatic celadon gallery, powerfully semantising abstract paintings intimate the linkage between the monochromatic masterpieces and Abstract Expressionism, as both arts construct visualisations of metaphysical concepts, be they the colour field as locus of sublimity or the edge variously apprehended as border, fission or delineation between aesthetic materialities and immaterial worlds36 (Figure 16). 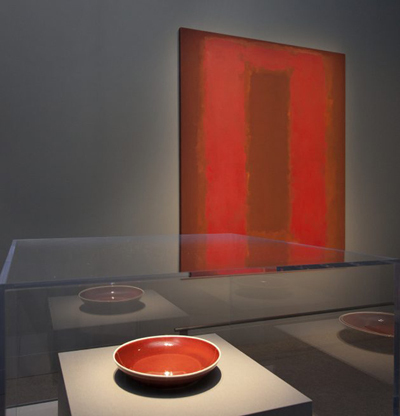 This same idea was behind the exhibition ‘Red: Ming Dynasty/Mark Rothko’, held in 2016–17 at the Freer Gallery in Washington DC, that showed a red Ming porcelain dish in an aesthetic-metaphysical conversation with a red Rothko painting. (Figure 17). 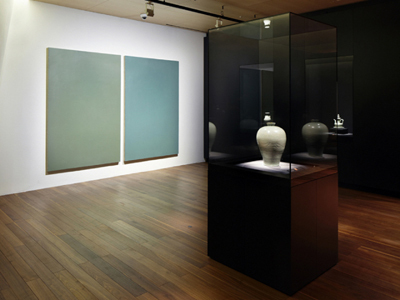 Gallery of Korean celadons, Museum 1, Leeum, Seoul. Photograph in the public domain. View of the exhibition ‘Red: Ming Dynasty/Mark Rothko’, Sackler/Freer Gallery, Washington DC, September-February, 2016–17. Photograph in the public domain. 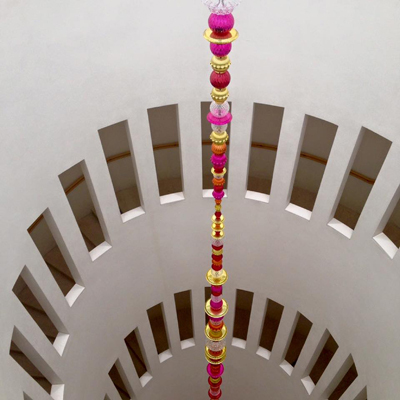 The inclusion of contemporaneity within installations of ancient art has been introduced in the late eighties and recently turned into a steady curatorial practice. The aforementioned Kunsthistorisches Museum was a pioneer in this practice, with an installation of modern sculptures in the picture gallery in 1989, among the classical masterpieces and not in a separate space. The current exhibition in this same gallery, ‘The Shape of Time’ recreates a similar situation. Yet, only a few museums in the world have, like the Leeum, pushed the practice further by giving these intimate interfaces the high status of permanent installations. Another example is the Museo del Banco de la República, in Bogotá, in which one may admire colonial paintings depicting dead Christian female devotees in their open coffins, arranged in two rows symmetrically unfolding toward a contemporary centrepiece: a monumental photograph of Marina Abramovic representing herself in levitation in a kitchen filled with pots and pans. Since the momentous 2001 exhibition ‘Ornament and Abstraction’ at the Beyeler Foundation in Basel, too rarely and always temporally do we get to see the artistic heritage of Islam in the expansive light of its connections with global contemporary creation.37 Some reputed institutions such as the Victoria and Albert Museum, the British Museum and the Freer Gallery do exhibit contemporary art by Muslim creators or inspired by Islamic heritage.38 The latest events to date are the 2018 show ‘Tape Art’ in the Museum of Islamic Art in Berlin and contemporary installations in two new rooms showcasing Islamic art in the British Museum that just opened to the public.39 A few among these institutions have even began to build a permanent collection of this new art, notably the Canadian Aga Khan Museum and the Los Angeles County Museum of Art (LACMA). However, for both these new collections and the ephemeral shows, the permanent historical displays only provide a loose semiotic framework as the use of separate spaces of display maintains the division of genres (Figure 18). The Aga Khan Museum does occasionally present mixed settings of old and new creation amidst the historical installations in the lower floor; but once the show is over, the traditional partition between the two genres is restored.40 As a result, these initiatives do not quite challenge the traditional sequencing of tradition and modernity, and do not quite allow for the thoughtful pinpointing of affinities between the ancient and new art worlds as the Leeum or the aforementioned museum in Bogotá do it by means of direct interface. Interior view of the Aga Khan Museum, Toronto. Photograph in the public domain. The use of this concept of ‘the Islamic period’ in the Met’s description of its collection bespeaks the confusion surrounding the definition of what is ‘Islamic’ and what is not in this area of curation, and in Islamic art studies in general.43 Putting aside this highly-questionable concept, the confusion culminates with the abysmally imprecise and ambiguous labelling of the gallery: ‘The Art of the Arab Lands, Turkey, Iran, Central Asia and Later South Asia’. The absurdly long list of regions squarely omits the term ‘Islamic’ and thereby silences what actually justifies their regrouping, namely Islam. But what is Islam? Suffice it here to refer to Shahab Ahmed, who answers this question masterfully in What Is Islam? The Importance of Being Islamic (2015). Ironically, if there was any sense in this gallery labelling, it would reside in its opening onto the modern art world. Instead, in the misnamed re-installations, the unnamed Islam remains enclosed in a reductionist periodicity excluding modernity. We may henceforth wonder why such issues mar this area of curatorship. The answer to this question lies in the social-historical background of Islamic art curation and studies. Two socio-historical parameters frame the curation of Islamic art: the colonial legacy and the ongoing conflicts in the Middle East. First, the colonial history of Islamic civilisation still influences the curatorial practice. As is well known, the conceptual tools employed to categorise the arts of Islam, write their history, and present them in museums were created by the colonial West. Symptomatic of the trauma of colonialism on the dealings with this material is the lingering debate about the concept of the masterpiece contested on the basis of its historical dependence on Orientalist taste and aesthetics.44 As a result, installations privileging aesthetic phenomenology are frowned upon and invariably criticised for their lack of historical context. Second, wars, extremism and political violence sadly affect the global relationships between Muslims and non-Muslims. The necessity to ward off fear and prejudice against Islam has driven curators and other art agencies to concentrate predominantly on introductory educational objectives. His Highness the Aga Khan’s speech about the museum in Toronto summarises this general climate: ‘One of the lessons we have learned in recent years is that the world of Islam and the Western world need to work together much more effectively at building mutual understanding— especially as these cultures interact and intermingle more actively… We hope that this museum will contribute to a better understanding of the peoples of Islam in all of their religious, ethnic, linguistic and social diversity’.45 The dominance of the sampling model and, by extension, the lack of diversification of display concepts are the direct result of this state of affairs. Panoramic displays of the Islamic cultures’ variegated artistic achievements are thought to be the most likely to raise the novice public’s interest and heighten their understanding. 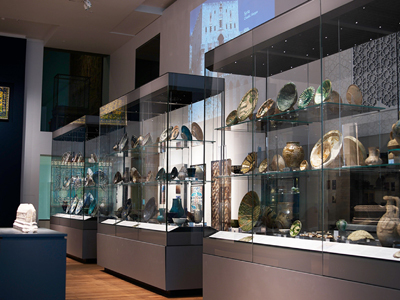 David Roxburgh missed this crucial point in his review of the Met’s 2012 rearrangements reiterating the old displays’ sampling scheme, as he praised ‘the absence of any effort to impart lessons about Islam, to use the objects as a blunt teaching tool in an exercise about Muslim religion and Islamic culture’.46 The replacement of the chronological order by a regional organisation does not change the didactic nature of the new scenographies. The columnist Jerry Saltz pinpointed the very feature that entrenches these scenographies in the established educational trend, as he wrote: ‘The Metropolitan Museum of Art’s glorious new Galleries for the Art of the Arab Lands, Turkey, Iran, Central Asia, and Later South Asia have an encyclopedic name, and they make the greatest encyclopedic museum on Earth even greater’.47 A brief description of one these displays will illustrate this point. One of the rooms exhibits Ottoman period textiles on the walls and floor, a monumental Mudejar ceiling, and a free-standing helmet that strangely recalls a lonely tombstone in the Ashmolean (Figures 5 and 19). The combination of textiles, woodwork and metalwork exposes the material’s dazzling richness, the high skills of its makers and Islamic ornament’s aesthetics. By no means innovating, and no less didactic than the Met’s old displays, this kind of exposition of Islamic art’s generic visuality and materiality has been the primary agenda of this art’s curation since the Orientalist period. The systematic filling of the space with different objects, each one related to a very visible and visually disturbing explanatory cartouche, conjures up the dense eclectic Orientalist reconstitutions of Islamic domestic interiors. These reconstitutions in the past intended to reveal the unknown beauties of Islamic art to the ignorant Western world. The helmet’s presence, placed on one side of the central carpet like a decorative pretty object d’art, contributes to revive these faded Orientalist images, even though a built-in installation of pieces of armour in a concealed corner of the room ultimately discloses this presence’s meaning. By way of conclusion, I propose a re-imagining of this display. 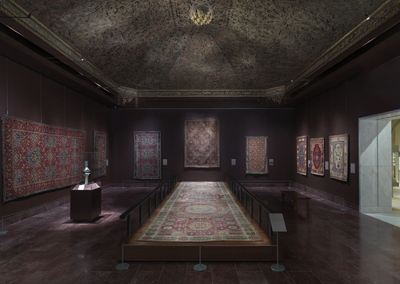 A room in the gallery of ‘The Arts of the Arab Lands, Turkey, Iran, Central Asia and Later South Asia’, Metropolitan Museum of Art, New York. Photograph in the public domain. A simpler arrangement of this room would set in a vertical cosmic dialectic the two most powerful aesthetic expansions in the room, namely the floor carpet and the wooden canopy above it. The walls and space around this setting would be left bare except for the one hanging textile facing the carpet, as it would insure a continuous material channelling the ascending and descending movement between earth and heavens through the fabric-wood threaded path of the floor-wall-ceiling. The built-in armour installation, phenomenologically disconnected from this ensemble due to its invisibility from the room’s main viewpoint, would be left to produce its own show. Importantly, the documentation would disappear from the surroundings to be placed discretely at the room’s entrance. Such a configuration would give anyone, a novice or a cultivated spectator in Islamic culture, a sense of the metaphysics translated by the objects displayed, and of their original function in the spirituality-informed Muslim world of aesthetic materialities. This suggestion of virtual rearrangement, however, does not imply that the curatorship should radically change strategy and sever its ties with established traditions that still make sense through the rich and specific history of the collecting and display of Islamic art. The idea is rather to encourage this curatorship to open itself up to creative avenues that would allow the museum experience of this art to reach another level beyond the acquisition of elements of knowledge on Islamic visual culture and a mere enjoyment of its riveting beauty, namely the deep level of an aesthetic-philosophical appreciation. With its compelling scenographies, the Leeum demonstrates that reaching such a level is possible in the artificial and decontextualizing space of the museum. 1David Balzer, Curationism: How Curating Took Over the Art World and Everything Else (Toronto: Coach House Books, 2014). For a comprehensive history of curation since the last fifty years, see Paul O’Neil, The Culture of Curating and the Curating of Culture (Cambridge, MA: The MIT Press, 2012). 2See Islamic Art and the Museum, Approaches to Art and Archaeology of the Muslim World in the Twenty-First Century, ed. Georges Khalil, Stefan Weber and Gerhard Wolf (London: Saqi Books, 2014); Ali Mozaffari, ‘Islamism and Iran’s Islamic Period Museum’ International Journal of Heritage Studies 19 3 (2013): 259–269. DOI: https://doi.org/10.1080/13527258.2011.652145. 3Gernot Böhme, Atmospheric Architectures, The Aesthetic of Felt Spaces, ed. and trans. A.-Chr. Engels-Schwarzpaul (London, Oxford, New York, New Delhi, Sydney: Bloomsbury, 2017), 16. 4See these websites: http://jameelcentre.ashmolean.org/collection/4/837; http://www.ashmolean.museum/documents/TTAislamicflyer.pdf; http://leeum.samsungfoundation.org/html_eng/global/main.asp; http://leeum.samsungfoundation.org/html_eng/introduction/structure01.asp. 5See the museum’s website: http://leeum.samsungfoundation.org/html_eng/exhibition/exhibition.asp?f_id=7. 6See, The Curatorial, A Philosophy of Curating, ed. Jean-Paul Martinon (London, New York: Bloomsbury, 2013); Adrian George, The Curator’s Handbook: Museums, Commercial Galleries, Independent Spaces (London, New York: Thames and Hudson, 2015). 7About the two distinct yet correlated notions of art and material culture, see Julia Gonnella, ‘Islamic Art Versus Material Culture: Museum of Islamic Culture?’, in Islamic Art and the Museum, 144–148. About the Korean celadons, produced in the Goryeo kingdom (918–1392), see Nigel Wood, ‘The technology of Korean celadon wares’, in Korean Art from the Gompertz and Other Collections in the Fitzwilliam Museum: A Complete Catalogue, ed. Yun Yong-i and Regina Krahl (New York: Cambridge University Press, 2004), 12–24. This volume offers a useful account of Korean clay art. 8The terminology ‘Islam’, ‘Islamic’ and its alternative ‘Islamicate’ are the object of debate in Islamic art studies. In this debate, I align myself with Shahab Ahmed in his posthumous opus magnum, What Is Islam? The Importance of Being Islamic (Princeton University Press, 2015). See Valerie Gonzalez, ‘Contesting the Conceptual Categories ‘Islamic Civilization, Art or Masterpiece’: A Reflection on the Problem’ Kimiya-Ye-Honar Quaterly 17 (2016): 5–14. 9To summarise, while China inspired Korean clay art, it has also been a model for ceramic making in the Muslim world from the beginning of Islam onward. Not only Chinese ceramics were highly valued and purchased by the Muslim elite, but also ceramists themselves would find technical and aesthetic inspiration in Chinese models. 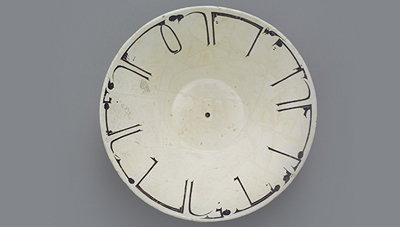 10In the plethora of publications on Islamic ceramics, see Oya Pancaroglu, Perpetual Glory, Medieval Islamic Ceramics from the Harvey B. Plotnick Collection. With transcriptions and translations by Manijeh Bayani (Chicago, New Haven: The Art Institute of Chicago and Yale University Press, 2007). 11See Dermot Moran, ‘Between Vision and Touch: from Husserl to Merleau-Ponty’, in Carnal Hermeneutics from Head to Foot, ed. Richard Kearney and Brian Treanor (New York: Fordham University Press, 2015), 214–34. 12Here the sublime is used as a generic concept. See the analysis of Samanid wares with epigraphic decoration in Valerie Gonzalez, Beauty and Islam, Aesthetics of Islamic Art and Architecture (London-New York: IBTauris, 2001), 100–105. 13See Paul Crowther, Phenomenology of the Visual Arts (Stanford: Stanford University Press, 2011); Art and Phenomenology, ed. Joseph D. Parry (London and New York: Routledge, 2010); The Phenomenology Reader, ed. Dermot Moran and Tim Mooney (London, New York: Routledge, 2002). 14For a reflection on this museum’s display conceptualisation, see Kjeld von Folsach, ‘Concepts Behind the New Installation of Islamic Art in the David Collection, in Islamic Art and the Museum, 225–231. 15See the exhibition catalogue by Simon Worrall, The Lost Dhow: A Discovery from the Maritime Silk Route (Toronto: Aga Khan Museum Publications, 2015). 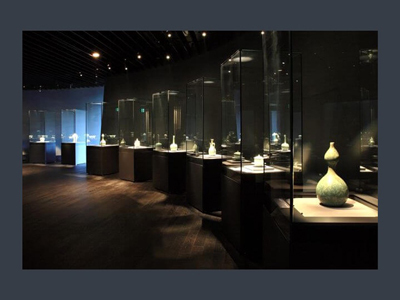 16About this exhibition see: https://www.blogto.com/arts/2014/12/new_aga_khan_museum_hosts_first_major_show/ It is also worth mentioning the example of the National Tea Museum in Hangzhou, China. While not being an art institution, this museum does not lack aesthetic stimuli. The objects bearing a certain aesthetic value such as carefully shaped compressed tea packs and tea pots, are accordingly presented in aesthetics- based arrangements. 17This reinstallation reflects the reductive functionalist trend in Islamic art studies in general of which a critique can be found in Valerie Gonzalez, Aesthetic Hybridity in Mughal Painting, 1526–1658, series ‘Transculturalisms’ (Farnham, UK, Burlington, VT: Ashgate Publishing, 2015), 29–34. 18Quotation on the back cover of Nicholas Serota, Experience or Interpretation: The Dilemma of Museum of Modern Art (London, New York: Thames and Hudson, 2007). 19About these essential concepts of ‘relational space and form’ in museums and galleries, and more broadly in perceptual contexts, see Nicolas Bourriaud, Relational Aesthetics (Dijon: Les Presses du Réel, 1998). ‘New aesthetics’ is the branch of aesthetic philosophy that emerged in the eighties. 20See the video ‘Beyond and Between’: http://leeum.samsungfoundation.org/html_eng/video/main.asp. 22See Eva Troelenberg, ‘Islamic Art and the Invention of the Masterpiece: Approaches in Early Twentieth-Century Scholarship’, in Islamic Art and the Museum, 183–88; and Miriam Kühn, ‘Museums and their Formations’, ibid., 215–21. 23James Joyce describes aesthetic epiphanies in Stephen Hero and A Portrait of the Artist as a Young Man. See Pablo Pachilla, ‘El concepto de ‘epifanía’ en la lectura deleuzeana de Joyce, Notas sobre la ontología de la obra de arte experimental’ Viso-Cuadernos de estética aplicada, Revista electronica de estética 14 (Julio 2013). http://www.revistaviso.com.br/. 24Excerpted from James Joyce, Ulysses/A Portrait of the Artist as a Young Man, A reader’s Guide to Essential Criticism, ed. John Coyle (Cambridge, UK: Icon Books, 2000), 73–74. 25Carol Duncan, Civilizing Rituals, Inside Public Art Museums (London, New York: Routledge, 1995), 1–2. 26See the museum’s website: http://www.miho.or.jp. 27Carol Duncan, Civilizing Rituals, 2. A similar criticism is implicitly made by Munir Fakher Eldin, ‘A Historian’s Task: Make Sure the Object Does Not Turn Against Itself in the Museum’, in Islamic Art and the Museum, 135–43. 28For an account of the whole project see ‘Les Arts de l’Islam au Louvre’ Dossier de l’Art, special number 199 (2012). A similar ceiling covers the renovated commercial complex of the historic Halles in Paris. 29In ‘Les Arts de l’Islam au Louvre’, 6. The translation of the citation is my own. 30Ibid.15. The translation of this citation is also my own. 31Expression cited from Hal Foster, ‘Why all the Hoopla?’ London Review of Books 23, 16 (23 August 2001): 24–26. The quotation is excerpted from Hal Foster, ‘Why did Architect Frank Gehry give his critics the finger?’ The Guardian (Sunday 26 October 2014). http://www.theguardian.com/artanddesign/shortcuts/2014/oct/26/architect-frank-gehry-gives-the-finger-to-his-critics. 32See the case study of this museum by Seif El-Rashidi, ‘Museums of Islamic Art and Public Engagement’, in Islamic Art and the Museum, 209–21. 33In The Phenomenology Reader, 284. About the politics of display that let ‘the objects do the talking’, see the brief article by Oliver Watson, ‘The Museum of Islamic Art, Doha’, in Islamic Art and the Museum, 264–69. In contemporary art see, ‘Tate Modern’s Switch House: art comes first’ The Guardian (Sunday 19 June 2016). https://www.theguardian.com/artanddesign/2016/jun/19/tate-modern-switch-house-extension-art-comes-first. 34My comment on this installation only relies on a presentation by one of the exhibition curators, Ridha Moumni, in a lecture organised by the Islamic Art Circle, SOAS, University of London, in May 10, 2017. I am grateful to Mr Moumni for allowing me to use the photographs of this installation that he kindly sent to me. See: Wikipedia: https://fr.wikipedia.org/wiki/L%27%C3%89veil_d%27une_nation. Exhibition catalogue by Ridha Moumni: http://www.sudoc.abes.fr//DB=2.1/SET=2/TTL=1/SHW?FRST=1, https://www.amazon.co.uk/L%C3%89veil-dune-Nation-Tunisie-1837-1881/dp/8899765251. 35Henry James, The Turn of the Screw and The Aspern Papers (London: Penguin Classics, 1986), 32, 73. 36The concept of the edge in art and related matters of objecthood is of utmost importance. See Andrew Causey, Drawn to See, Drawing as Ethnographic Method (Toronto: University of Toronto Press, 2017), 73–114. Regarding the exhibition see this website: http://www.asia.si.edu/exhibitions/current/red./. 37Oleg Grabar was the first scholar to draw parallels between Islamic and twentieth-century art. See Oleg Grabar, The Mediation of Ornament (Princeton, NJ: Princeton University Press, 1992). See also the comment on this exhibition by Valerie Gonzalez, ‘The Comares Hall in the Alhambra and James Turrell’s Space that Sees: A comparison of Aesthetic Phenomenology’ Muqarnas 20 (2003): 253. 38For a definition and bibliography of ‘Islamic contemporary art’, see the last part of Valerie Gonzalez, ‘Islamic Aesthetics’, in Oxford Bibliographies in Islamic Studies (New York: Oxford University Press, 2016). http://www.oxfordbibliographies.com/. DOI: https://doi.org/10.1093/obo/9780195390155-0228. 40See the video in https://ismailimail.blog/2017/02/13/persian-flying-carpet-aga-khan-museum/. 41Susanne Lanwerd in ‘Do You Speak Islamic Art? The Museological Laboratory’, in Islamic Art and the Museum, 206. 42Emine Fetvaci, ‘New Galleries for The Art of the Arab Lands, Turkey, Iran, Central Asia, and Later South Asia’ CAA Reviews (October 23, 2013). http://www.caareviews.org/reviews/2183#.V5eObGWMCT8. 43About the expression ‘Islamic, vos avez dit Islamic?’. This French interrogative expression ‘vous avez dit’ (‘you said’) that repeats twice ‘la chose dite’ (the thing said), once before and once after the statement, became canonical across linguistic fields. It expresses perplexity with a witty tone and a touch of irony. It is based on the French actor Louis Jouvet’s famous utterance: ‘Bizarre, j’ai dit bizarre, comme c›est bizarre’, in the French classical film by Marcel Carné, Drôle de Drame, 1937. 44See Eva Troelenberg, ‘Islamic Art and the Invention of the Masterpiece’, in Islamic Art and the Museum, 183–88. 45Quoted by Anna Seaman in ‘The Aga Khan Museum to Open in Toronto’ The National (August 24 2014) https://www.thenational.ae/arts-culture/art/the-aga-khan-museum-to-open-in-toronto-1.260703. See the video of the opening ceremony: https://www.youtube.com/watch?v=yhPHnK9CrSk. 46David Roxburgh, ‘The New Galleries for ‘The Arts of the Arab Lands, Turkey, Iran, Central Asia and Later South Asia, The Metropolitan Museum of Art, New York’ Art Bulletin 4 (December 2012): 641–44. https://scholar.harvard.edu/files/droxburgh/files/art_bulletin_dec_2012.pdf. 47Jerry Saltz, ‘Metropolitan Museum’s New Islamic Art Mecca’ Artnet. http://www.artnet.com/magazineus/features/saltz/metropolitan-museum-islamic-art-11-4-11_detail.asp?picnum=3.